Didn't have any vacation all year, didn't travel apart from work-related stints, and was really longing for a break! A cousin was getting married, and I had to go! Weddings are fun, getting to meet the entire extended family, have fun, eat awesome food and dance all night. We were put up at Country Inn & Suits by Carlson - Ajmer which looks like was a great property once upon a time but is now not maintained well. Our room was a good one, with a nice verandah and basic amenities. We took a direct train to Kishangarh - Ajmer and I was travelling by train after 4 years! And because we left on a Wednesday, and I was working till Tuesday night I had no time to pack or visit the parlour for a facial etc. To the rescue for the latter was the Ozone Ayurvedics Acne Healing Facial Kit I received a few days before the travel. Facial + Acne Healing in one product is like a boon for someone like me who still suffers from the random uncalled stress/hormonal break-outs. Ozone Ayurvedics offering a complete professional range of Cosmoceuticals brings consumers a step closer to a revolutionary skincare product-Ozone Acne Healing Facial Kit. During summers, the skin gets exposed to harmful UV rays and dust which makes the skin oily leading to bacterial formation. For acne, dryness and other harmful effects caused by environment, this product from Ozone is ideal for women fighting this daily environmental stress. Acne healing facial kit- for clear and pimple free skin, works as a nourishment and optimal hydration to the skin to treat excess acne in one go. It is designed for oily, sensitive, acne prone skin. The ingredients of this organic facial effectively control the acne and eruptions, leaving the skin with flawless radiance. It will result in thoroughly cleansed and refreshed skin that is moist and non-sticky without any tightness, revealing a glow to the skin. 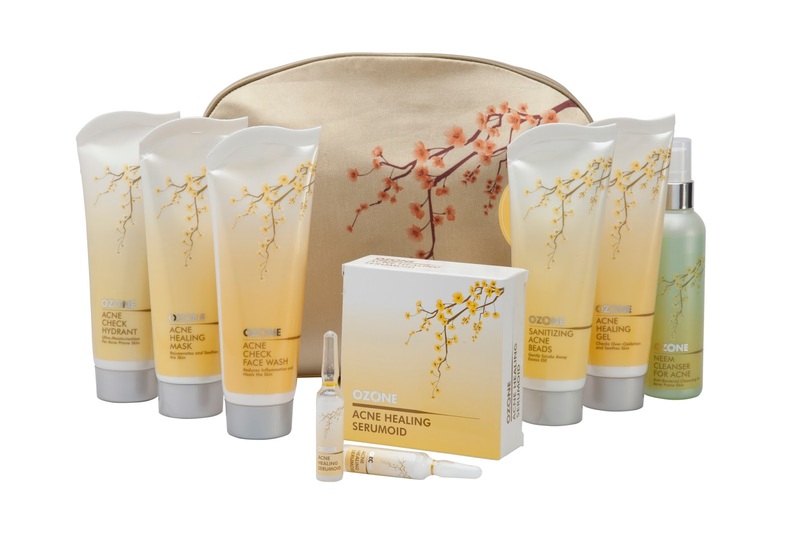 Priced at INR 2000/-, this kit includes: Neem Cleanser for Acne, Sanitizing Acne Beads, Acne Healing Serumoid, Acne Healing Gel, Acne Healing Mask and Acne Check Hydrant. The product should be used twice in a month for best results. I received the travel/mini version which are mini-tubes containing one time use of all the above mentioned products. The tubes are easy to open, with instructions clearly mentioned. Total time for the facial is around 45 minutes. If you intend on using it while travelling, make sure you also carry cotton balls/tissues with you. My face felt fresh and clean, non-oily after using the facial, like you generally do after facials. But to see the true effect on acne reduction, I guess you'd have to use it a few times. Their pack also mentions and advises to use their Acne Healing Face Wash and Acne Check Hydrant regularly. I wore a Kalki gown for Sangeet followed by a Frontier Raas Floor Length Anarkali that I styled like a lehenga for the Wedding/Reception. The Anarkali was from Flyrobe and was a good deal and perfect fitting! I also received a really adorable travel wash-bag from Olie's Travel Collection. I absolutely loved the delicate and thoughtful packaging it came in, and the delight of the train print on it, specially since I love train journeys and was taking one after years. And it's handmade yet practical - with the waterproof lining inside. I totally want to get my hands on their overnighter - perfect for weekend trips or work trips! Do check them out. About Olie - a label that reflects a simpler life, and free spiritedness. Olie showcases whimsical illustrations that are hand-printed onto reams of fabric on the products, which are entirely hand-made. Every step of the making process involves many hands, many souls and a lot of love. 'The Travel Collection' celebrates the joy of travelling by train and day-dreaming a little, amidst conversations, cups of tea and ever-changing land and seascapes outside the windows. The products in this collection include a range of beautifully detailed and handcrafted Overnighters, Journals, Shopping Bags, Wash Bags, Pouches and Wet Sacks. These multipurpose products are perfect for busy moms who are ready to conquer the day, without missing a beat. It was a nice and brief review of the products and I would also recommend these products as the favorable ones for the weddings as I have already tried them. Renu Das Kolkata Escorts Services has Kolkata Escorts gorgeous females provides Independent Escorts Service in Kolkata call girls at 100% satisfaction with VIP models. Provided Kolkata escorts at our agency are professional in nature and are eager to serve you at your place.